Dirt Devil Lift & Go Reviews - Is it a Scam or Legit? The new Dirt Devil Lift & Go claims to be a versatile, lightweight, portable, and powerful vacuum that can give you access to any part of your home that needs to be cleaned, including stairs and other traditionally hard to reach areas. On top of this, the Dirt Devil Lift & Go can vacuum and dust your hard floors at the same time. But does the Dirt Devil Lift & Go really make cleaning easier, or is it just marketing hype? Let’s clean up the facts and see what they have to say. But where the Dirt Devil Lift & Go gets its name is from its detachable Carry Canister that is claimed to release with a push of a button, and to allow you to easily clean furniture, stairs, or anywhere else that a full-size vacuum would be cumbersome. In addition, the Lift & Go’s HEPA Quick-Rinse filter is claimed to trap 99.97% of particulate matter a small as 0.3 microns; its 30-foot extended reach cord allows you to clean even the largest rooms without unplugging; and its soft wheels won’t scratch floors. It appears the Dirt Devil Lift & Go is only available through Walmart.com, and is priced at $119.99 plus free value shipping. Replacement SWIPES pads are only available directly through Dirt Devil, and will cost you $7.99 each. All Dirt Devil Lift & Go vacuums come with a 30-year limited warranty for motor and parts. What Do Other Consumers Have to Say About the Dirt Devil Lift & Go? The Lift & Go is manufactured by Dirt Devil, a division of TTI Floor Care of North America, based out of Glenwillow, OH. With more than 140 closed complaints over the past three years, the company holds an F rating with the Better Business Bureau, most of which appear to reference problems with their products. Regarding the Lift & Go specifically, it appears to be a relatively new product, as no online customer reviews were available outside of the Dirt Devil website. However, those that were available during our research appeared to be mostly positive, although some common complaints included poor suction and that it needs a longer hose. What’s the Bottom Line About the Dirt Devil Lift & Go? 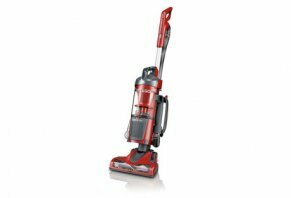 When compared to similar lightweight vacuums such as the Hoover Air Cordless, the Dirt Devil Lift & Go is priced much more reasonably, and doesn’t seem to experience many of the problems associated with cordless vacuums. However, because the Lift & Go appears to be a relatively new product, we weren’t able to find any online customer reviews, other than on the Dirt Devil website. With this said, it appears that most customers were pleased with their purchase, although several complained of poor suction and of a hose that’s too short. The good news is that the Dirt Devil Lift & Go is available through Walmart.com, which provides free shipping and has a reputation for easy returns, should you be dissatisfied with your purchase. Have you used the Dirt Devil Lift & Go? If so, do you feel it was a good value for your hard-earned money? Help others make a more informed decision by writing your very own review today! Poor suction due to poor connection between canister and hose. Power brush is a joke (useless). Don't get hose and cord crossed, you'll drive your self nuts putting this thing away. Write a Review for Dirt Devil Lift & Go!